My Perfect Scratch Cake Recipe. The single makes two 8″ rounds or two 9″ rounds depending on your elevation and how full you like your pans. Add butter in small chunks and mix with paddle until crumbly. Combine wet ingredients. Whisk together with eggs. 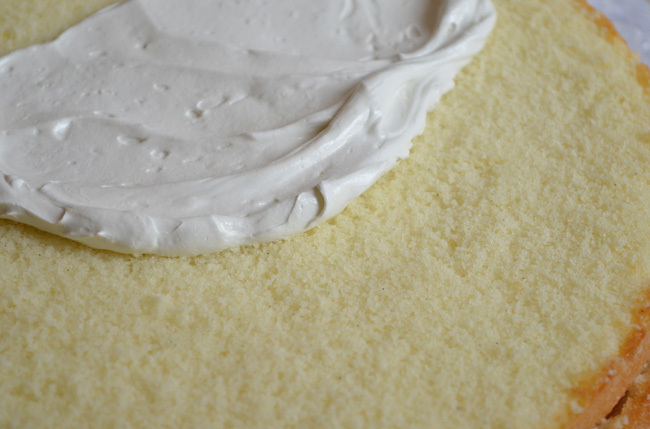 Add 1/4 of wet ingredients to dry until moistened, increase speed to medium high and mix for 2 minutes.This step is VERY important for creating structure. If you skip this step, your cake will fall when it bakes. Not mixing for 2 minutes on medium high is the #1 reason this recipe doesn't turn out.After mixing for 2 minutes, the cake batter will turn light and fluffy and lighten in color. Add 1/2 of remaining wet ingredients and continue mixing on low. Scrape bowl. Add remaining wet ingredients and mix until combined. After combined, turn speed up to medium for 30 seconds. Bake at 335º in a prepared pan for 30 minutes or until a toothpick comes out clean from the center. Do NOT overbake. For lemon cake: add lemon zest from 1 lemon. Omit vanilla extract and add lemon extract. Updated version of vanilla cake recipe is now available on Sugar Geek Show. When I first started out baking and decorating, I had no idea what kind of cake to bake. I started out with boxed mix and had horrible problems with how soft and fluffy they were. Great for eating, not so great for stacking a wedding cake. 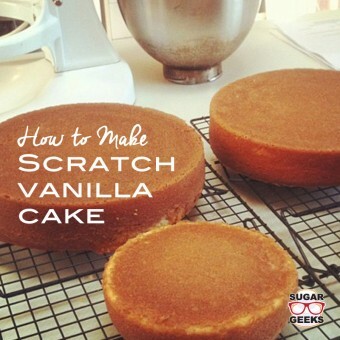 Here is my recipe for the perfect vanilla buttercake that I use for all my cakes. I have adapted it to make other flavors as well like lemon or spice but the basic recipe is the same. The crumb is tight and melts in your mouth. This is what you’re going for. If you have huge holes in your cake, you are over-mixing and this can cause uneven rising. Plus it doesn’t look very good when you cut into it. Note: the method in this recipe is very very important. You must whip up the first portion of dry ingredients and liquid until your batter is light and fluffy or you will have a bad texture. I know it feels weird but you have to do it. This is what your batter should look like when you first add in the liquids, after you whip up the batter and then after you add the rest of the liquids. A single batch makes two 8″ rounds. Fill pans 3/4 of the way full for 2″ tall cakes or it can make two 9″ rounds that are shorter. It depends on how full you like your pans. I also chill my cakes in the fridge overnight so they are easier to handle when stacking and filling with buttercream. Chilling your cake is HUGE. Trust me, once you discover how easy it is to cover a chilled cake, you’ll never go back. Hi can we have the recipe in metrics please. I Love this recipe and it always comes out perfect! However I tried to add sprinkles because my kids love confetti cake and every time it changes the texture and doesn’t taste right. Is there any right amount or any way that I can make this a confetti cake for my kiddos? Or is it that I’m using the wrong sprinkles IDK? Please help I need to make them birthday cake soon! Because I have 3″ deep pans, I make 1.5X the recipe amount. I develop the air in the batter by incorporating 1/4 of the wet mix into the dry and I let the mixer rip on speed #4 for two minutes (that’s when I get that pale white color batter like in your video). When it gets to that pale color, it is not as stiff as the batter is in your video, it is more thick, but my end-result batter (after I incorporate all the liquid) looks exactly like your end-result batter. Do you think my first mix is less stiff than yours because my butter is too soft? After, I prepare my pans by wrapping them with a damp towel around and put one flower nail in the middle (I also grease and flour the pans and flower nails). I bake at 300F for 1 hour and 8 minutes. I check for doneness by making sure the cake doesn’t jiggle anymore and let it bake for another 5 mins after i notice it doesn’t jiggle anymore. Then I slowly open the oven door and that’s when the shrinking starts to happen. At that point, I keep checking the cake for doneness until it’s ready (little crumbs on toothpick and internal temp of almost 210F). When the cakes cool, they shrink even more. I’m feeling a little disheartened but I really want to get this recipe down. Is there something in my process I’m messing up and should be doing differently? I’m attaching pictures of my freshly baked cakes. 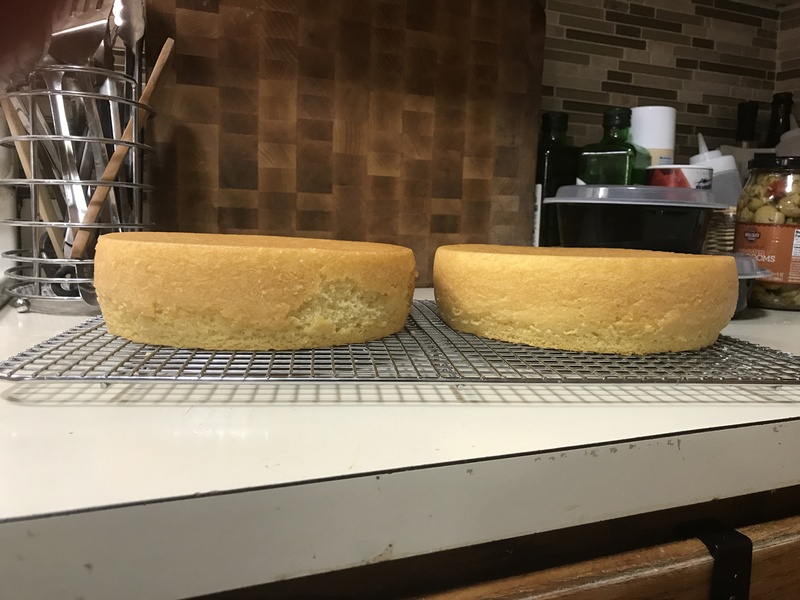 I took measurements of my 8″ cakes and the bottom of the cake hasn’t shrunk much but it’s mainly the top that is about an inch less in diameter than the bottom. I attached a picture to show you what they look like. Thanks so much for a great recipe that I can hopefully get the technique down for! What height are your finished cakes when you use this recipe? Mine is 1.5″, but yours look taller. If they are taller, I should probably do the first mix longer to develop more air and structure. Is it possible to use a substitute of eggs in this recipe? Like applesauce or any other. Since i started baking again i had been on a quest to find the most perfect moist vanilla cake…AND THIS IS IT! No special ingredients just TECHNIQUE TECHNIQUE TECHNIQUE! In the video she says the cake is cloud like…this is no lie! I am so thankful to find you Liz! I’ve used it for cupcakes…it’s perfect still! The cake came out looking perfect but tastes a bit like corn bread. I used Swan cake flour. Any ideas? I absolutely LOVE this recipe!! It is the best i had in a long long time, their is just no other recipe i have tried that compares!!! so thank you!!! Thank you so much for this recipe! It is perfection.. Also, the cake batter tastes absolutely divine!! Followed the recipe exactly like in the video. The only substitution was for cake flour, which isn’t readily available where I live. 1 cup AP flour – 2 tbsp AP flour + 2 tbsp cornstarch. Worked really well:) Texture and taste were both great. Thanks for sharing! omg thank you ty ty…i looooove this recipe and how you explained it perfectly. Everyone who tried said it was amazing and moist. The basic ingrediets…no sour cream no buttermilk…perfect every time…ugh i can’t tell you how much i adore it. Can you pleeease share the chocolate version? or have I just not found it here yet? Is it important to have all of the ingredients (eggs, milk) @ room temp? Hi Liz, I made this cake a few weeks ago and these taste was delicious OMG I couldn’t stop eating the batter however, the batter was thin and runny but it seemed to bake up just fine. I made the lemon version today and again the batter was runny and looked super curdled…I decided to give it a go and still bake it but when I got it out of the oven it was uneven, super oiley and the bottom was extremely dense and wet. I don’t know what I did wrong because I used a food scale and measured everything accurately. Any help would be greatly appreciated as I love the flavor of this cake! Sounds like your butter was too soft and you added the liquids too fast so your batter is breaking. I LOVE this cake recipe I use it all the time!!! The lemon version is to die for!!!!! I have a question. I have to make a 3 layer 12×12 cake. I have 12x12x2 pans. How much batter would I need? Will a double batch fit in a 5 quart stand mixer? we loved this recipe!!! I had no problems. could one add spice & chopped apples to this batter to make a spice apple cake, do you think? I’m sorry but for this recipe you have to use a scale or it wont work. May the Lord Above bless here and hereafter. If I were to bake your vanilla cake in a loaf pan how long would it bake for? and it would make two pans or one? Can you make this cake with buttermilk and would you need to add baking soda to the recipe. 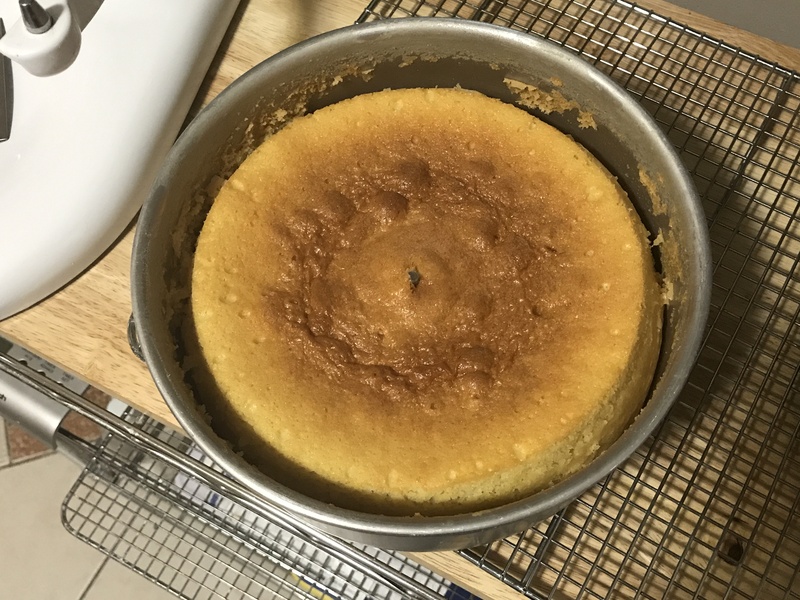 I made your vanilla cake a few times and came out great – last time I made it there were wet spots what did I do wrong? also I let cook 10-15 minutes then I take out of the pan to cook on rack – but the top always sticks to the rack, I even spray the cooling rack but still some cake sticks to the rack is there anything I can do to prevent this? I’m not sure what the wet spots are from, maybe some cold spots of batter or under-mixed. Gonna try this out right now for my wife’s Bday tomorrow. Thanks for the recipe! Hi Liz, thanks so much for sharing your recipe with us, I can’t wait to try it out! I have a question about the wet ingredients, are you measuring them with fluid ounces or “normal” ounces? I’m using the metric system so I’m just wanted to make sure which one to use for the conversion. thanks so much! I remember someone else asking this and the reply was that it was normal ounces. I have used the recipe that way. Awesome, thanks so much Sandra! Hoping you will see this comment! Since I first tried it out I must have made this recipe at least 9 times, trying to perfect it. This is no reflection on you – it is because I am a Brit ex pat in Spain, where we don’t get the same flour. Our flour is unbleached, (EU regs I believe) so acts differently. A little tinkering with the flour quantity has led me to believe that it is possible to get pretty close to your result, with the following changes. Changing of flour type and quantity. This was the only way I could get a decent rise on the cake – and get it to stay there when baked! 10.5 oz of Flour for Bizcochos (Mercadona brand in Spain) instead of 9 oz of cake flour. I added one level tsp of baking powder but I may not have needed to. This flour already has raising agent in it. I also took the salt down to a mere pinch for the same reason. The flour has a protein content of around 9%, but is meant for cakes anyway. I had tried the recommended (in various places) option of subbing cornflour (cornstarch) for some of the flour, but that left the mix too low in gluten to hold up and the cakes withered on cooling. For those in the UK, I suspect that if you find a SR Flour with a protein content around 9%, it will be just like the flour I use. I would suggest omitting the baking powder to start with and only adding some if you don’t get a decent rise in the oven. For test purposes, I suggest using a half batch till you get it right. Once you do, this will become your favourite go to recipe, I can assure you! I made one today with chopped walnuts folded in at the end. I torted it and filled with icing, adding more nuts on top. Delicious! I made this a couple of days ago, just a small one (half batch) to try out. I’m in Spain and didn’t have the right flour so used bizcocho flour with only half the baking powder. I think I could have omitted it altogether. I flavoured it with almond extract. It is really yummy! Mine sank a little bit (too much raising agent I think) but it was still really good. I am planning on using it soon for a 3 tier birthday cake. It has kept nice and moist, without being greasy. Lovely, thanks! liz I want to make a 1/4 (9×13) cake how much batter do I need? Hi Elizabeth , I just baked your vanilla cake and I want to thank you for sharing this wonderful cake recipe. my cake came out perfect, the flavor was amazing the texture was perfect. I will not use another recipe I feel I have found the perfect one and thank you!!! Hi Elizabeth, I love this cake recipe. Would I be able to use it for cupcakes as well? Please advise. I made the recipe tonight and the first batch came out good i think(it smelled awesome), it made one 9×2 and one 6×2 the batter was thicker so i couldnt get 2 9×2’s filled. They ended up being around 1.5″ high. Then I went in for my second batch and doubled the recipe and filled 2 9×2’s 3/4 high because i wanted closer to 2″ layers and was left with some batter, maybe enough to fill a 4×2 so i kept it to the side for my 3rd round, HOWEVER i realized 15 min into cooking the second batch that I completely forgot to add the baking powder, uggghh!!! I let it cook and they rose to the top of the pan, but as they cooled the shrunk a bit, so from that angle i think im ok. My concern thought is will it effect the taste and texture? I really dont want to waste them because i used a lot of product, but im making a double barrel cake and im not sure if it will be noticeable if i have 2 layers made properly and 2 that are missing the baking powder, what do you think? Thanks so much!!! This is what happened to me. Followed your instructions to a T. Could it be the oven was not hot enough at 335. ? Also, did I hear you say “I wish you could smell this MEXICAN VANILLA” ? Where is that in the recipe ? it says vanilla extract on her recipe.you can use what ever vanilla brand.i have heard mexican one are really good though. I don’t think I can to bake this cake again. I just want a big spoon and to sit down with the bowl of batter. This is seriously the best batter I’ve ever had. I don’t know about the cake, because I just finished frosting and decorating my first one tonight, and I’m waiting for my wife to come home before I cut into it. Sorry for the question and I feel silly asking but when the recipe is asking for cake flour is that the all purpose flour or the self rising flour for cake … This will be mi first time trying to bake your recipe and a newbie in baking. gm! I’ve made this recipe for quite some time and recently every time I make it the butter breaks in the batter. Any ideas on what I could be doing wrong? My first attempt was a failure. It didn’t rise and the base of the cake looked compacted. I’ve just tried making it again and this time, the cake turned out great! I wanted a taller cake so I baked half of a single in a 6 inch pan. It rose to 2.5 inches. Took about 1 hour and 15 minutes to fully cook through because I used cake strips. Liz, thanks for a great recipe. You are generous and awesome! I also <3 the LMF. My cake never really cooked in the middle, I won’t waste my time and products to do over again. Glad it worked for you. What could have went wrong? Also. How do I know what number on my kitchenaid mixer corresponds with you receipe speed settings? ie… Low or medium high? Soooooo Ive tried making this recipe 3 times with no success…. BUT even though my cake come out all shriveled and flat it was the tastiest cake I have had period! So hopefully after reading some reviews I’m going to attempt it again today…This time with.. I made this as a lemon version and it turned out great! My family ate In silence and smiled after lol. I took that as real approval! Thank you so very much for sharing. I’m really wanting to try this recipe for my sons 2nd b day party this November 15th I’m wanting to mk a rectangular cake that’s going to feed 25-30 people. Can I just adjust the serving size to 25 and use a rectangular pan??? Plus is there a way to confirm the measurements cuz oz just throw me off! HELP plz reply soon. Omg this cake was amazing!! I made it for sons first birthday. This will be my new go to from now on. Thank you for being so generous and sharing. How many cups of batter should this make for the 2-8″ – cause I doubled it to make a 12x18X2 (4-8″ according to Wilton) and I only wound up with about 8.5-9 cups of batter and I needed 15-16 cups….Did I do something wrong or is just the batter rises really well???? Hi! I really love this recipe. How much batter would I need to fill a 9x13x2 inch pan? I’m a big fan thanks so much for your generosity sharing recipes. I’ve baked this cake many many times. The flavor in incredible. I’ve had a few problems though. I absolutely mix the first addition of liquid for at least two minutes. Then slowly add the remainder 1/2 then the last half. I bake at 335 (using temperature Guage) and test with toothpick for doneness. Each time I believe I’ve got it right the cake does two things – it cracks at the top and once cooled slightly collapses. I don’t want to give up because I believe the flavor is lovely and texture could be perfect. Any advice? Hi Liz, I would like to know how to adapt this recipe for a 13×18 ” pan. I’m doing a filled birthday sheet cake but have never made this recipe. Hi Liz I followed your recipe but I when to look my cake in the oven and I looked so inflated I try to see what I did wrong and I see that the recipe says 4 tsp of baking powder for the single, came out good but I wonder is this 4 tsp is going to change the structure of the cake. Thank you!! Hi Liz, I would like to try the recipe this weekend for a 1/2 sheet cake. What would the measurements be for the ingredients? Hi Liz, Ahhhhhhhhhh!! For me, third time’s the charm with this recipe. I see that I’m not the only one who has struggled a bit with it so I thought I’d share my experience, for what it’s worth. The first time and second time I tried this recipe I found my cakes looked okay while baking, but would pull far away from the sides of the pan and sink down while cooling. The thing that kept me going is the flavor was SO GOOD and I wanted to achieve the texture you showed in the video you made of making this cake! I was determined! This last time it worked! And I think I figured out why. That first addition of liquid after the sand stage and before the “building structure” stage was just too much. I think I flooded my dry ingredients to the point where they couldn’t incorporate the rest of the liquid successfully, which meant my batter was thinner than it should have been. With just adding an ounce or two at the most at that very first addition, then beating for 2 minutes, then adding the rest of the liquid much slower than before (but like you do in your video) I ended up with a perfectly thick, fluffy batter and BEAUTIFUL cakes! Just thought I’d share for those who may still be struggling. Please keep trying, it’s so worth it! The texture and taste of this cake is heavenly! Thank you for sharing your talents with us, Liz. I am a (local!) fan and even though I am not an artist, like you are, I do love to make delicious cakes. You have helped me do that. Thanks for the recipe Liz! I had a problem with sinking too, and two bakes in I haven’t been able to resolve it. I’m an experienced baker, so I’m assuming I just need to familiarise myself with the recipe. I also live in a very hot, very humid country, so it might be the conditions. 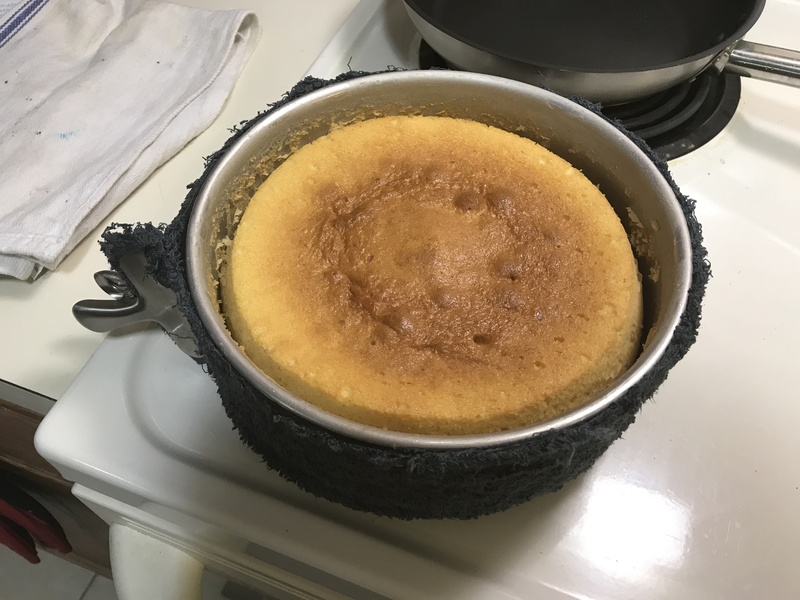 I saw a reader baked baked her 6″ cake for 1hr 15m which seems long to me, but made me think perhaps I was underbaking mine. With the skewer test, they look fine, but did sink after. On to third try and will report back! Hi Liz, I just wanted to tell you, thank you very much for your recipe. I tried it double batch for a 2 11″round and came out delicious and with great texture, flavor and moisture. I have to tell you though at the beginning once I took the cakes from the oven they looked very soft and when trying to put it in a cooling rack seemed that they were going to fall apart, but once it cooled completely it was perfect. I am wondering if I can replace the milk for any other liquid such as fresh squeezed orange juice and/or flavored orange soda, also if I can add chocolate chips and or strawberry puree. Please let me know. I would like to use this cake for my son’s second bday party this September coming. I really appreciate your response. I came across this recipe while looking for a basic vanilla cake to add sprinkles to for my son’s birthday. The ounces threw me off a bit, but I just used the 4 1/2 oz = 1 cup conversion. I used all purpose flour as that is all I had on hand. I upped the vanilla to 1 tsp and used heavy cream to replace half of the milk. I only had 2% milk in the house. I added about 1/2 cup of rainbow sprinkles. The batter itself tasted delicious and the cake turned out perfectly. I baked it at 325 degrees for about 45 minutes. The cake is absolutely delicious. I topped it with vanilla buttercream frosting. Thank you so much for posting this recipe. It is now the only one I will use. Hi Liz I’m a bit confuse on exactly how much is 9oz of cake flour 8 oz is one cup but then I saw a conversion method stating 1 cup is 4 1/4oz can you share the ingredients in cup versions thanks in advance. Please use a scale for this recipe. Hello Liz, Thank you for the recipe and video, it helps a lot! I am wondering what size is your mixer bowl? My is 5 qt and I felt this is the reason why I could not achieve the right thickness. Hey Liz, just wanted to tell you that I made this recipe last night and it was amazing. I made the lemon version of it with the lemon extract and the lemon zest. OMG…it was so good. I made cupcakes and it yielded 18 cupcakes. I used cake flour and the cupcakes had the finest texture I ever tasted, they melt in your mouth. I baked the cupcakes at 335 and mine turned out with the dome which is what I wanted ( I probably overfilled the cups). Thank you so much for the recipe and everything you do and share with the world. I looooove your work! Your little one is so adorable! Have a great day! I typically use extra light EVO when baking do you know if I stick with this oil will it alter the recipe? Also any suggestions on making a strawberry cake, just add fresh strawberries? Is this a good cake for under fondant? And Can I add strawberry puree to it, do I need to omit anything? Awesome! Just keep in mind that this batter is formulated to be flat on top so it might not be so great for cupcakes if you want a dome. I have heard that you can make them dome by pumping up the heat in the oven to 375 for the first 5 minutes then dropping down to 335. Do you know about how many cups of batter the single recipe makes? I was thinking 3 or 4. It seemed slightly less than a box cake mix when I made it before. I don’t know how many cups but I would bump this up to a batch and a half if you want really tall 8″ round layers. Thanks for the reply. I’m making a wedding cake, so your recipe and I are going to be good friends in the next couple if weeks. thanks for sharing it! Can i also freeze this cake? I am going to make my first weddingcake, but since i am also a busy pastry intern, i need to bake the cake a few days before the wedding. Yes you can freeze and then thaw before use. The milk, oil, and other liquid ounce measurements…are these by weight or measuring cup ounces? Thanks! Hi Liz! How long does your cake take to come back to room temperature after being in the fridge overnight? And does it come back to the same fluffy softness as before refrigeration? Thanks! Love this cake! It just depends on how warm it is in the room but yes it comes back to the same texture if it is crumbcoated and covered in buttercream so it does not dry out. I live in Sweden and we do not have cake flour. Can I just add corn starch to the flour or do I need baking powder as well? I made cupcakes with this recipe and they were delicious. I am going to try to make some cakes next time because I loved the taste and texture of the cupcakes. The recipe was easy enough to follow. Did you get a dome on your cupcakes or did they stay flat? Did you bake at the recommend heat? Hi Liz! Have u used this recipe for pillow shaped pans? Or giant cupcake pans? Basically, I want to know how it holds up in different shaped pans. Do u have any tips for making a tiered pillow cake? Thanks! So I realize that 3.4 tsp is supposed to 3/4 tsp….but only AFTER I made 4 batches of this to fill a half sheet, tasted the batter and got really pissed. You may want to change the way that’s written. I’m not the only one who did this and I’m not a beginner baker (just off my game, apparently). Otherwise, great recipe. I’m excited about making it the right way. Does this recipe multiply well; double or triple for 9 and 10 inch cakes? Do you have to adjust anything? Thank you. I love good vanilla cake because you can dress it up with so many things. Hi Liz, thanks for your recipe. I am based in the UK and have tried your recipe but unfortunately I don’t think UK Sainsbury’s cake flour is the same as US cake flour, it seemed very light. Also when I added the butter to the flour, it got very wet and sticky and not like your crumbly flour mix. Are you able to advise what we would use as your cake flour please? Thanks v much. I am unfortunately not familiar with UK brands so I can only guess. You might have just mixed the butter and flour for too long or the butter was too soft. Hi Liz I just made the vanilla cake recipe. I tasted the batter and it seems very salty. Is 3.4tsp right for an 8 inch size? yes that is right, did you use unsalted butter? Thank you so much for this great recipe. I have baked a couple cakes using your recipe and they came out perfect both times. The second time I drenched it with a simple syrup and rum mixture. Everyone raved about this cake! I think this will be my go-to vanilla recipe from now on. Hi Elizabeth! Is the triple batch for a 12″ round pan (2″ high) and the double batch for a 10″ round pan (2″ high)? Thank you! This cake is absolutely delicious…BUT…like the others, the cake is falling. I read your instructions carefully, multiple times and I watched your video twice :(. I’m not sure what I’m doing wrong. I made 3 batches this morning. I am adding a 1/4 of the liquid for that really important step…maybe too much liquid?? I am also getting layers that are just 1″ tall (8″ Wilton). if they are falling they are under-mixed. If your layers are too short then make a batch and a half. Hello Liz, Thank you so much for the recipe. It worked really well, very moist and delicios!!. I just wonder if I can use this recipe as my base for a strawberry cake, just add like 1/2 cup of strawberry puree? Any sugestion? Thank you so much for this recipe. I tried this recipe with 1 1/2 eggs and it was just out of this world. So moist and delicious. It is the easiest recipe ever. I followed your “single” recipe to the letter, my batter was runny. It looks as if you have more than 9oz of flour in your bowl. Did you use more? This seemed like a good cake for wedding cakes, but it didn’t work for me. nope the single batch is 9oz. If your batter was runny then you didn’t mix it properly. You have to add in just a little liquid and let it mix for a full 2 minutes before adding in the rest of the liquid. I made 6 batches for a cake, all were crumbly. Any ideas on what I am doing wrong? I love the flavor of the cake though! Thank you for the video! I was so excited when I came across it because I can NEVER get my cakes from scratch to come out right. Unfortunately I struggled with this one too. I had to cook the cakes for 50 minutes and the middles sank, I made 5 batches and they each came out that way. Do you have any insight on what I am doing wrong? 3/4 a tsp! agh, I did 3 tsp and a bit! How full should the pans be? My 8 inch pans were probably half full. It seemed a little low and I wondered if I got my measurements wrong or something. I used a scale. They shouldn’t be filled more than half way, half way is about perfect. I’ve always filled more and it said about 3/4 full on the video I think. Mine didn’t raise a whole lot either. Once baked shouldn’t they be about 2 inches tall? I fill mine 3/4 of the way full so they go all the way to the top. Depending on your results, you might need to make a batch and a half to have enough for two completely full 8″ pans. Aby suggestions in where I can find a conversion chart if if don’t own a scale and need to use measuring cups? Hi Liz Love this recipe! if I want to make a batch and a half how many eggs should I use 4 or 5? Thank you!